Home / Events / Gourmet Food & Wine Expo...So Much Wine! 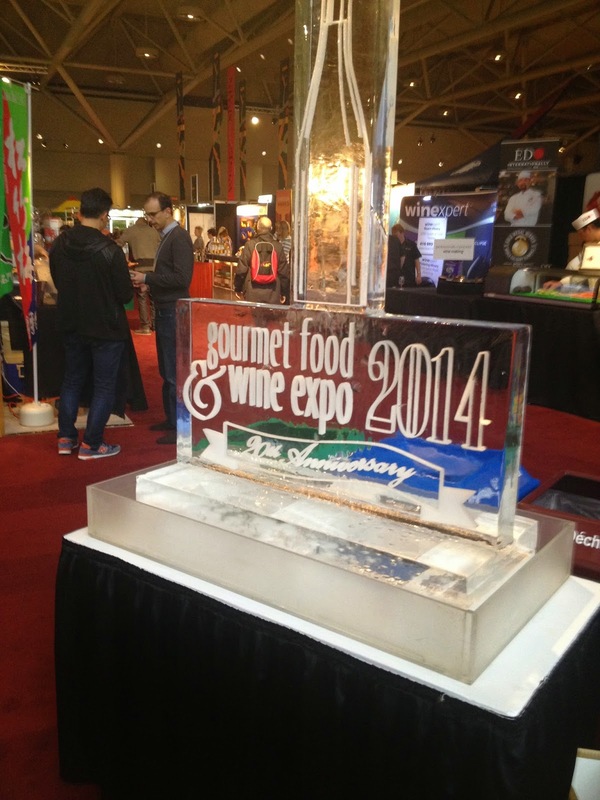 Gourmet Food & Wine Expo...So Much Wine! My first time attending the Expo, but I know people that go every year, so I knew it had to be good. I enlisted the help of 2 aunts to join me on this delicious quest. We headed to the Metro Toronto Convention Centre, bought sample tickets and went in. We started at the far end and worked our way back. Grabbing a fresh wine glass on the way, we looked for some libations to start. Let me tell you, we did not have to go far for a drink of ANY kind. Food took longer to find....which is why I was on my way to my 3rd drink sampling and had nothing to eat. Knowing thinks could get sloppy very quick, I started looking for some eats when I heard an angelic voice say, 'Would you like a grilled cheese with mango chutney?' SAVED! 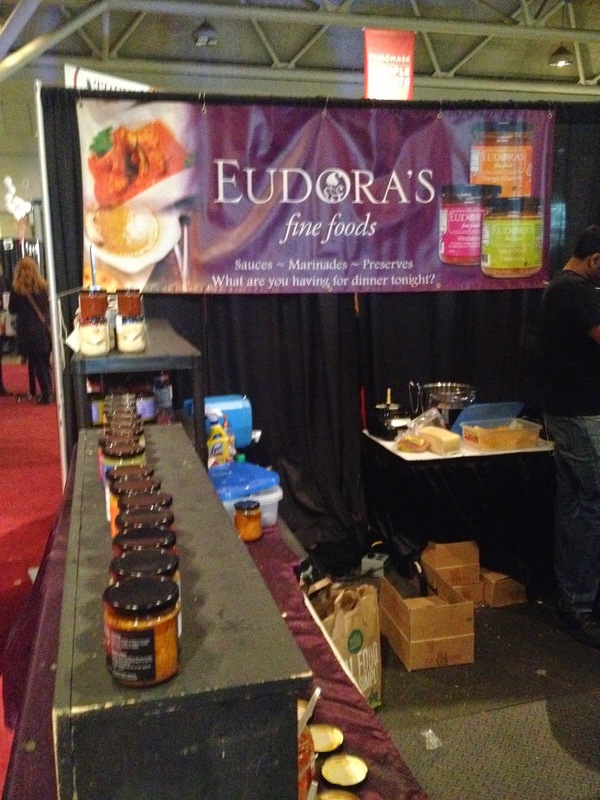 Eudora's Fine Foods and their delicious sauces, chutney and preserves were there to save me from embarrassing myself. Cheddar cheese with mango chutney on rye bread was heaven. The chutney was sweet and paired well with the savoury cheese; ketchup didn't even cross my mind. I'm ready to put it on everything I eat. Try it! My aunts were unable to tear themselves away from their favourite wines, California wines and ports. I saw many of my favourites there as well, Fruli, Beringer, Mill Street, but I wanted to try something new! Cranberry wine was calling me. Muskoka Lakes Winery brought some tart wines for us to sample. They had cranberry, cranberry/blueberry and a dessert cranberry wine sweetened with maple syrup. I went with the Cranberry wine. It had a little of the expected and a little of the unexpected. It had the familiar tart flavour in cranberry juice, but with the dryness of white wine. It was an enjoyable sipping wine, but I couldn't have more than 1 glass. Just around the corner was my next snack, Rock Lobster! I manage to run into these guys at every event I go to, so a Lobster Roll was definitely in the cards. Fresh and lobstery as usual, this place had a line up for a good reason. The staff there are always very friendly and fun. Gotta love Rock Lobster! Time for a good ol' glass of beer! Have you ever tasted a Beer Banana Split? I can now say I have. The Young's Chocolate Stout caught my eye and beside it was Well's Banana Bread Ale. I said I couldn't decide and he fixed that in a hurry. Mixing them in the proper proportions made this a delicious beer dessert. Not too sweet, just the right mix of yum. The Mexico area was fantastic. It had a large array of food and drink. There was tequila of course, but there was also jams, hot sauces, a variety of spirits and salsa. The vendors knew their stuff and were happy to teach you about their products from home. What's that? Time for more beer? Don't mind if I do! My next stop was Collective Arts Brewing. This was the coolest booth of the whole expo. Definitely blogworthy. It's more than delicious beer with a cool label. The labels are created by emerging artists all over the world! It gets better. Download the app Blippar and the labels come to life! Scan the label and it will play a song from an emerging band. The app gives you the option to check out the band's website or buy their music. How cool is that?! Brings the phrase 'Beer is an Art' to a whole other level! The loot bag. This is the best one I've ever got! I was not there on a press pass; this loot bag was for everyone! 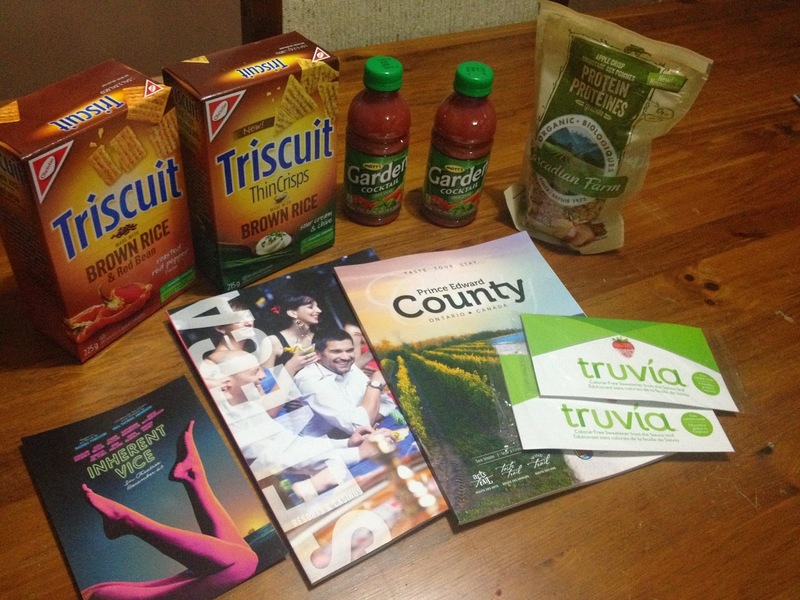 It consisted of 2 full boxes of Brown Rice Triscuits, 2 Truvia samples, 2 Garden Cocktails, Cascadian Farms Organic Apple Crisp cereal(that I am now addicted to) and magazines with delicious food and wine adventures in them. Fantastic! This expo was a lot of fun. I didn't even get to sit in on a sampling or workshop and it was still a great tasting and learning experience. I'll never miss it again!